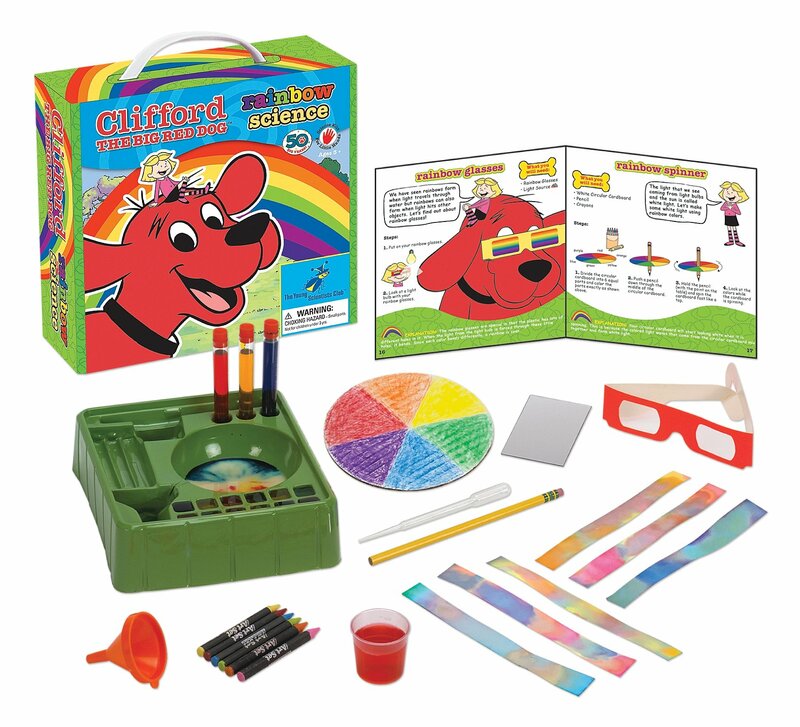 Clifford and his friends love exploring the world around them and with thiscolorful kit they are learning all about RAINBOW SCIENCE! Emily Elizabeth, thenarrator in the colorful 20-page manual, guides young scientists throughthrilling experiments with catchy titles such as milk rainbow, mixing colors,rainbow star, ceiling rainbow, moving colors, chromatography bookmarks,colored bubbles in oil, colored bubbles in a tube, catching a rainbow, rainbowglasses, rainbow spinner and rainbow explosions. Young Scientists will feellike real scientists when they use the included colorful lab tray, measuringcup, test tubes, pipette and funnel to perform their experiments! JoinClifford and his friends on an adventure into the world of science!